A month ago I found myself dodging traffic in one of Chennai’s older areas, Mylapore. I was on an errand to buy a herbal medicine for a cousin. The shop I was looking for is well-known but hard to locate. Dabba Chetty Shop, as it is called, is tucked away amid the cluster of small shops lining Kutchery Road. Here you can find nattu marundu (folk medicines) for every malady from dandruff to diabetes. The wall is lined with pigeonholes filled with roots and herbs. The one I wanted was called pillai petha marundu. It’s eaten by women who have recently had a baby. The medicine is a mixture of herbs that the Dabba Chetty shop keeps ground and mixed in plastic packets. Having bought the medicine, I sat down to talk to the owner, K Badrinath. He was frequently interrupted by customers. When I introduced myself to Badrinath, I wasn’t sure if this quiet, unassuming man in a simple white shirt and veshti (dhoti) was the owner of the shop. In between taking care of his customers, Badrinath spoke about the shop. His great grandfather started it as a general provisions store in 1885, he said. Mylapore was then a sleepy village with hardly any shops nearby. About 40 years ago it became a specialist shop. “It used to sell herbal medicines even then. 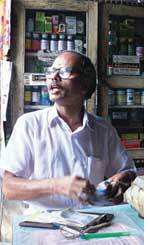 When mushrooming of other general stores made it very difficult to stay competitive, we took over the niche of herbal medicine,” said Badrinath. Today, Mylapore is a bustling shopping area in Chennai. We stopped talking when a middle-aged, stout man approached. He asked about medicines for treating diabetes. The man also wanted to know whether eating ‘English medicines’ (allopathic medicines) while taking herbal treatment would be a problem. Badrinath put together three-four different herbal powders and instructed the customer to take it daily, and advised him to continue his allopathic treatment. The course of medication has to be completed, he told the customer. Listening to Badrinath’s patient counselling of his customers, I asked how he learnt about herbs. “It’s just experience. I learn by listening to my customers. They tell me if a treatment works or not,” he said. Experience also decides what medicines he stocks up on. Certain products are more popular and stocks have to be replenished daily, sometimes several times a day. He grinds some of the medicines and mixes them in proportion. “This is a convenience our customers appreciate,” he said. The fast-moving products are Deepavalli marundu (eaten to digest rich food during the festival season) and a bathing soap mix, which contains, among other things, turmeric and kadalai maavu (besan or gram flour). Badrinath has a grinder set up in a small place round the corner. This is a change Badrinath sees from when he was young. “When my father ran the shop most people would buy the raw materials and grind the medicines at home,” Badrinath said. We keep the raw materials as well in case people want it, he added. Meanwhile, customers milled aro-und him. One of them asked what she can use to stop her scalp from itching. Badrinath asked if it was dandruff and brought out a small bottle of oil. This was not his own concoction, but a branded oil. Looking closely at the shelves, I noticed it was not just whole herbs and roots he stocked. He also sold herbal products from well-known companies like Dabur. He said he sells what customers want. As for the herbs, he buys them from local suppliers with whom his family has had a long relationship. I asked him if his children will continue running the shop. “I don’t know. They are both studying in high school, so who can say?” he said with a resigned air. As I left I asked why the shop is called Dabba Chetty. Badrinath smiled. “I don’t actually know why,” he said and then added it might be because of the dabbas (boxes) used to store herbs earlier.